Jean Larrivée Guitars Ltd, originally based in Canada, produces high quality acoustic guitars. Founded in 1967 by Jean Larrivée the company was moved from Toronto to Victoria in 1977 and to Vancouver in 1982. A second plant opened in California in September 2001 which produced their satin models. In 2013 the operation in Canada was closed down and all production moved to California. The first Larrivée Guitars were based on European classical guitar designs and became part of the Larrivée Family Collection. From 1968 to 1970 Jean continued building classic guitars in his home shop before moving into his first commercial space, building his first steel string guitar in 1971. After this Larrivee began adding inlay designs to their guitars and in 1977 inlays became a standard for their guitars. Beginning in 1978 their inlay designs took on a more romantic style. 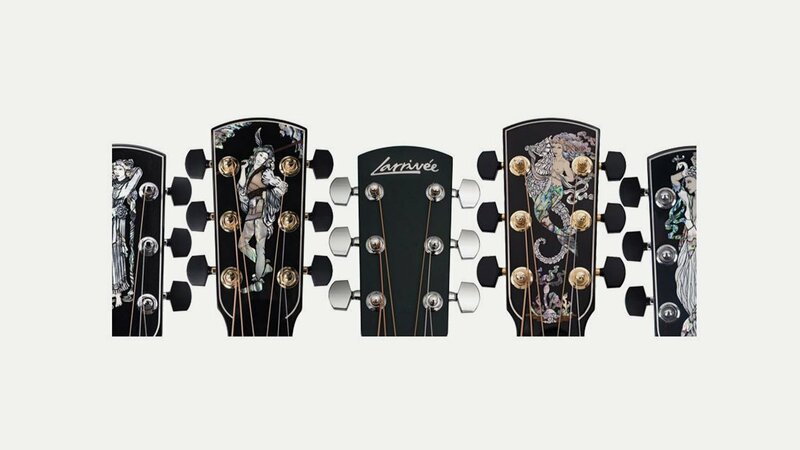 Since 1979 all engravings were designed by Wendy Larrivee except for a 1998 inlay called the “Joker.” In 2007 Larrivée began using laser engraving for their inlays. His first steel strings were small dreadnoughts, braced in the Martin style; Larrivee then changed to a different bracing pattern, which, much-refined, is still the heart of all Larrivée steel-string guitars. The sound it produces is distinctive. The bass is solid and tight, with great projection. Mid-range is strong, and highs are crystal clear. Overall balance is excellent, with the body size and shape determining the “tilt” of the balance. In 1983 he began to build solid body electrics when the market for acoustic guitars declined; by 1989 they were producing acoustics again.